A magnificent history of the American conquest of the West; "a story full of authority and color, truth and prophecy" (The New York Times Book Review). In the summer of 1846, the Army of the West marched through Santa Fe, en route to invade and occupy the Western territories claimed by Mexico. Fueled by the new ideology of “Manifest Destiny,” this land grab would lead to a decades-long battle between the United States and the Navajos, the fiercely resistant rulers of a huge swath of mountainous desert wilderness. At the center of this sweeping tale is Kit Carson, the trapper, scout, and soldier whose adventures made him a legend. Sides shows us how this illiterate mountain man understood and respected the Western tribes better than any other American, yet willingly followed orders that would ultimately devastate the Navajo nation. Rich in detail and spanning more than three decades, this is an essential addition to our understanding of how the West was really won. A native of Memphis, Hampton Sides is editor-atlarge for Outside magazine and the author of the international best-seller, Ghost Soldiers (Doubleday), which was the basis for the 2005 Miramax film, The Great Raid. Ghost Soldiers won the 2002 PEN USA award for non-fiction and the 2002 Discover Award from Barnes & Noble, and his magazine work has been twice nominated for National Magazine Awards for feature writing. Hampton is also the author of Americana (Anchor) and Stomping Grounds (William Morrow). A graduate of Yale with a B.A. in history, he lives in New Mexico with his wife, Anne, and their three sons. Were you familiar with the Navajo wars before reading Blood and Thunder? How do the book's historical details compare with what you previously believed about the West? The contradictions in Kit Carson's personality make him an alluring figure. How was Carson able to embrace so many aspects of Native American culture, even marrying two Indian women, but nonetheless lead campaigns that crippled them? To whom (or what) was he most loyal? What was John Fremont's essential quest in exploring the West? What spurs all explorers to pursue risky journeys? What do the biographical details in chapter six indicate about James K. Polk? What might have stoked his determination to claim the West? How did he manage to keep military leaders motivated, despite Polk's ambiguous leadership style? Is American literature's love of the "noble savage," inspired by characters such as Fremont and his pathfinder Carson (chapter nine) a thing of the past? Who are the heroes in new fiction of the twenty-first century? How did the post-colonial unrest in Mexico affect U.S attempts to purchase and conquer the West? What racial hierarchies were in place among Hispanic and Indian populations there? What is the current legacy of these conflicts? Is the underlying concept of Manifest Destiny still used to justify violence around the world? What did Carson's words and actions reveal about his understanding of divine will? What does Carson's illiteracy, paired with his knowledge of numerous languages, say about him? What distinguishes the power of the written word from the power of the spoken word, as evidenced by Carson's enthusiasm for an epic poem by Lord Byron? Is a society truly literate if its members are not versed in more than one language? Did the Texas Confederates believe they were different from (or even superior to) the Confederates fighting closer to the Mason-Dixon line? What were the stakes for both sides as the Civil War played out in the West? How did the reasons for this war compare to the reasons behind Native American warfare and raids (such as the Comanche raids on dwindling resources at the end of chapter seventeen)? Why was Carson able to scorn generalizations and see Native Americans as individuals? What made him resistant to the hubris of men like General Carleton? How would you have responded if you had been a witness to the both death of Navajo chief Narbona (which closes chapter thirty-two) and the brutalization of Ann White (depicted in chapter thirty-five)? In what way was the landscape a "warrior" in Blood and Thunder (as in the Washington Expedition's encounter with Canyon de Chelly, depicted in chapter thirty-four)? How have various populations perceived the landscape of the West, from ancient populations to modern-day tourists? Discuss the promises that were made to Mexicans and Indians by Americans such as General Kearny. Why did so many of the treaties and pacifist proclamations prove to be hollow? How was this lack of concern for credibility justified? What did Carson seek in a wife? What prevented him from being more involved in the lives of his children? Did his first child, Adaline, fare better or worse than his other children, who were raised with less structure? How did you react to the scorched-earth tactics that forced the Navajos to begin their doomed migration? How would you categorize these tactics of war? Why has the Navajos' Long Walk, until now, been less well known than the Cherokees' Trail of Tears? 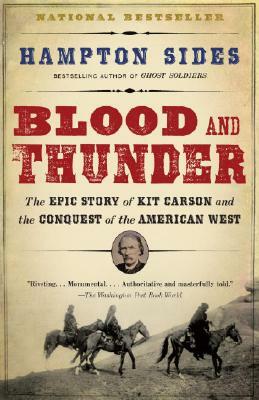 The book's title is derived from the rousing "blood-and-thunder" pulp novels that made Kit Carson a caricature. Were fictionalized versions of his life harmful? Is exaggerated storytelling a necessary component of most cultures? Why have some Native Americans rejected historical and linguistic evidence for their global migrations, preferring to maintain dramatic myths instead? Why did Kit Carson die in poverty? What does it say about Carson that his estate comprised considerable debt—owed to him by others? What are the appropriate means of measuring a life's accomplishments? What was the ultimate fallout of the history contained in Blood and Thunder? Where do Indian and American identities now stand, in response to each other? How would Kit Carson advise contemporary America on diplomacy and fighting terrorism? How did he balance the need to win allies with the need to be perceived as a fearsome warrior? How did Kit Carson's ideas about American Indians evolve over the course of his life? Do Americans still have an emotional investment in believing that the "winning" of the west was a glorious, even heroic endeavor? How does the real story of western conquest differ from the one we were taught in grade school? During its first war of foreign aggression, the United States seized many thousands of square miles of territory from Mexico. How should this historical fact shape the current debate over Mexican immigration‚ especially considering that the states most keenly affected by the immigration controversy (California, Arizona, New Mexico, and Texas) are the very states the United States appropriated from Mexico?